If, from high above, you could pick up California, stretch it out thin from tip to tip and then flip it in a graceful arc over the equator, you'd have a piece of land that looks pretty much like Chile. Last month, CEOs and politicians met in Santiago to discuss Plan Chile-California, a trade agreement that would create a "partnership for the 21st century" in areas such as education, energy and agriculture. For the past 10 years, though, Paula Tejeda has been quietly working her own brand of business development and cultural exchange, one empanada at a time, in San Francisco's Mission District. Stroll by the Redstone Building on any Saturday or Sunday to taste for yourself her efforts to connect Chile and California. Chile Lindo, named for a song extolling the beauty of the country, is a storefront kitchen known and loved in the neighborhood for its meat turnovers. 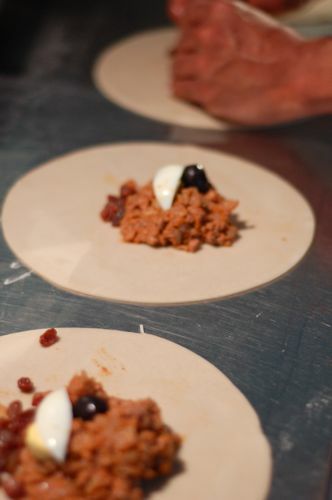 The classic Chilean empanada is simple and instantly recognizable: thinly rolled dough filled with beef, egg, black olives and raisins and then folded into a distinctive trapezoid shape. No lazy half-circles or crazy curried-duck-and-cardamom-with-rhubarb-compote combinations here in Paula's kitchen. This is the real thing. And very very good. 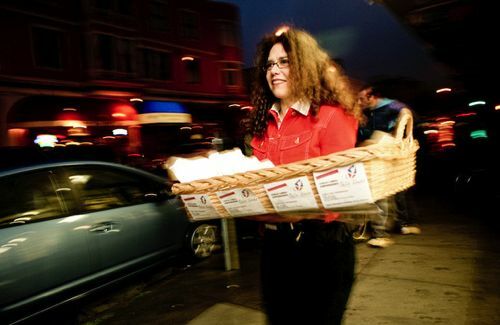 She carries her savory pastries along Valencia Street during the lunch hour, selling to merchants who can't leave their shops. You’ll see her offering them to hungry patrons during Friday happy hour at the Make-Out Room and the Latin American Club. On a sunny day, you might even spot her in Dolores Park with her familiar wide, wicker basket. Anyone who can resist Paula's smile, warm banter and freshly baked empanadas, has a heart -- and stomach -- of unyielding ice. 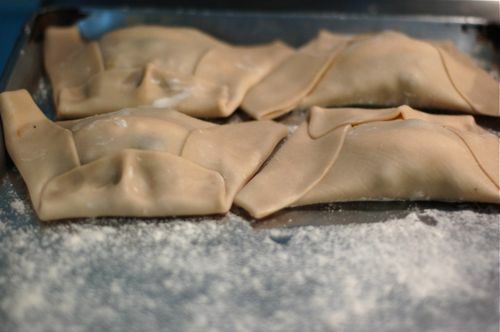 One newly converted customer claimed her pastries are even better than Julia's in D.C, knocking down the queen of empanadas and pushing the never ending East Coast-West Coast rivalry into the world of Latin American meat pies. 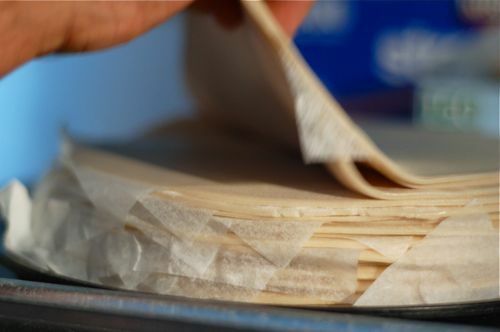 While Paula long ago gave up the rolling pin for the ergonomic convenience of an automatic pastry sheeter, each empanada is still cut, filled and folded by hand. She tracked down a special, rougher grind of beef from a local butcher to mimic hand-minced meat and shops for her cumin and other spices from nearby Bombay Bazar. Since it opened in 1973, Chile Lindo has passed down through three different owners. After running the kitchen for a few years in the late 1990s, Paula took a break to study at City College and then Mills College. A detour to the Renaissance Entrepreneurship Center recently re-fired her business interests. With a business plan in hand and lots of meetings with potential funders, she intends to grow Chile Lindo over the next several years. She needs $50,000 to transform her current kitchen into a café, complete with an espresso machine and comfortable décor and an expanded menu that includes other Chilean sandwiches and snacks. Currently, a neighboring restaurant loans out their ovens to her. An assistant, Ramon, forms the empanadas, four at a time, in the mornings, and Paula takes to the pavement herself to sell them. She's still teeny tiny micro as businesses go (considering that the SBA defines any bakery with 500 employees or less a small business). Fortunately, the Bay Area is rich with programs that help entrepreneurs incubate their businesses from idea to profit. La Cocina, Women's Initiative, C.E.O. Women and Renaissance are especially supportive of food ventures, helping countless informal vendors become successful business owners. As her business grows, she'll be adding other items to the menu. One that many of us are eagerly awaiting is the hotdog completo, a Chilean specialty that highlights fresh avocado, diced tomatoes and mayonnaise. For now, before the lines grow too long, stop by Paula's Chile Lindo kitchen and ask for one of her empanadas.